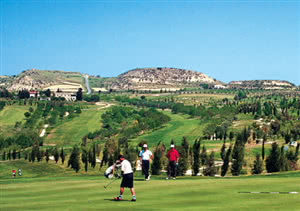 Minthis Hills Golf Resort, formally Tsada Golf Club, is the oldest golf club on Cyprus. Laid out around an old monestary in the hills behind Pafos the 18 hole course is always well maintained. Offering fantastic views at every turn the course is very enjoyable to play. With elevated tees inviting a full drive but the narrow fairways advising caution the course provides a great challenge for players of all ability. Despite the fact it is set in the hills the course is an easy walking course and because it's at an altitude of 550 meters above sea level the course benefits from cool mountain breezes and so is playable even in the heat of summer.